With Lewis Hamilton’s heroic drive in the British Grand Prix alive in our imaginations I am looking forward to this coming weekend’s 2018 Goodwood Festival of Speed. Lewis Hamilton made a less than perfect start from his pole position at Silverstone but it was Ferrari driver Raikkonen’s collision with the Briton’s Mercedes at Turn 3 which sent him spinning from the track. Hamilton’s drive from the back of the field to take second place will surely go down in Formula 1 history as one of the great drives. I am in the company of Toovey’s Automobilia specialist and motoring enthusiast, Gordon Gardiner as I remark how the atmosphere at Goodwood Festival of Speed captures something of the an endurance road race from the 1950s as spectators line the course at close quarters and the cars speed up the climb. Our conversation turns to a watercolour by Michael Wright. 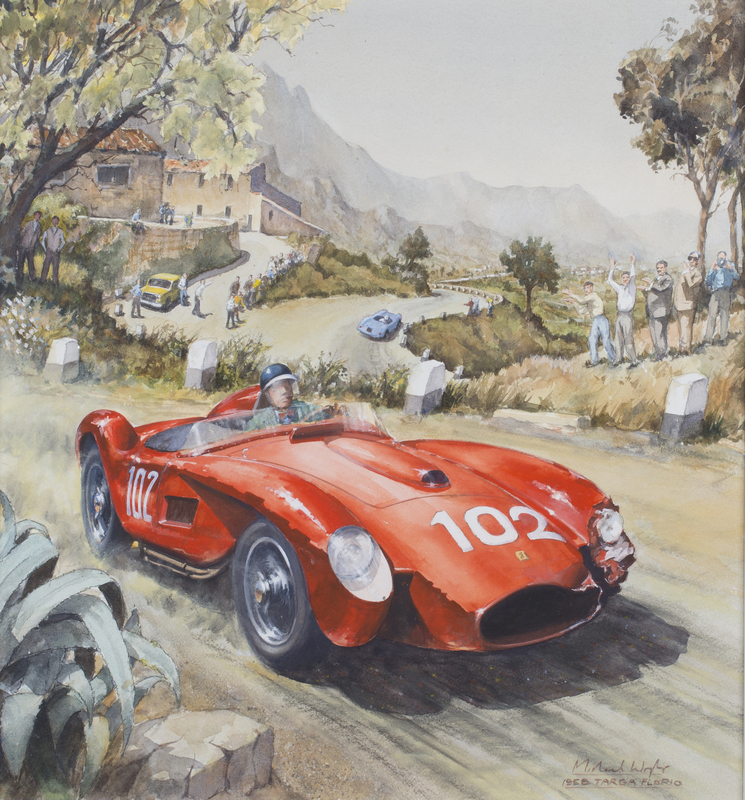 It depicts Mike Hawthorn flat out at the wheel of his Scuderia Ferrari 250 TR 58 which he drove with Wolfgang von Trips in the 1958 Targa Fiorio. In 1958 it formed the third round of the World Sportscar Championship. The car is being driven at great speed along the Sicilian roads which formed the 45 mile circuit of the Targa Fiorio where Hawthorn finished in third place. The Targo Fiorio was an open road endurance race for automobiles held in the mountains of Sicily near Palermo which was started in 1906 by Vincenzo Florio. Mike Hawthorn was noted for his speed and it was in 1958 that he became the first Englishman to win a Formula 1 World Championship. Toovey’s next auction of Automobilia will be held on Friday 2nd November 2018 and entries are already being received. 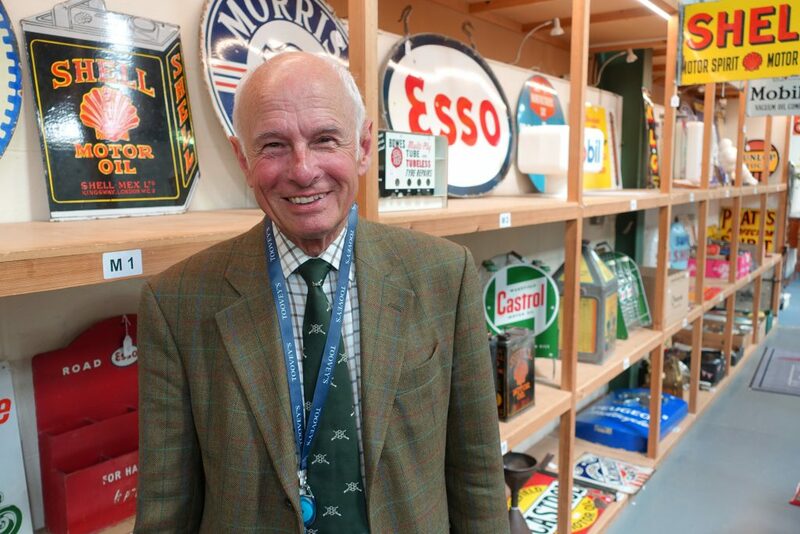 If you would like advice on collecting Automobilia you can contact Gordon Gardiner by telephoning 01903 891955 or emailing auctions@tooveys.com. Gordon and I are looking forward to the 2018 Silver Jubilee Goodwood Festival of Speed celebrating the 25th anniversary of this remarkable motoring spectacle. No doubt motor racing enthusiasts will be out in force enjoying the spectacle and drama of this annual Sussex event in the company of the Duke of Richmond and the Goodwood team. To find out more visit www.goodwood.com.